For something that really gives value for money, choose Fractionated Coconut Oil by Plant Therapy. Though a carrier oil, it is still our top pick for its antibacterial properties. And since it’s a carrier oil (with a lot of benefits on its own,) you can combine it with essential oils of your choice for that added extra power. If you love aromatherapy sessions, go for Essential Oil Labs’ Lavender Oil. It is a perfect choice for psoriasis because it fights stress—which is one of the triggers of the condition. Bergamot Essential Oil by Plant Guru is another product that offers value for money. The oil can be used for a lot of purposes, and has a warm, citrusy smell to it that you’ll truly love. For something that holds the USDA organic certification, go for Gio Naturals’ Pure Certified Organic Tamanu Oil. This certification serves as assurance that what you’re getting is absolutely pure. It is also very versatile, which means you’re really getting your money’s worth. A carrier oil, this product still makes it on our list of the best essential oils for psoriasis because it is an excellent moisturizer and emollient—a reason why it is highly recommended by medical practitioners. The good thing about this oil is that it has been fractionated. Unlike other coconut oils, it has been heated in order to separate essential fatty acids into various components. This results in a more deodorized, clarified, and refined end product. It also stays liquid, making it a perfect addition to your lotions, creams, and other cosmetic products. It also does not clog pores, or leave a greasy feeling on the skin. Full of natural vitamins, coconut oil is great for psoriasis because of its anti-inflammatory and antiseptic properties. These help in soothing inflammation and in alleviating itching. Coconut oil is also great for avoiding psoriasis flare-ups as it helps in destroying free-radicals that stimulate inflammation of the skin. This oil makes it on our list of the best essential oils for psoriasis because aside from being great against various skin conditions, it is also a perfect antidepressant. Now you can have aromatherapy sessions at the comfort of your own home. against wrinkles for a youthful glow. This oil is also extremely versatile. Because of its scent and healing properties, it is a favorite addition to deodorants, repellants, lip balms, etc. Stress is one of the triggers of psoriasis. Lavender oil is known for relieving stress. This oil should be used for psoriasis because of its ability to heal lesions. It works by hydrating the dry patches and by stopping bacteria from spreading. Aside from its antimicrobial properties, its anti-inflammatory agents help in the healing process and replaces old skin cells with new ones. Lastly, it creates a new layer of skin due to its rejuvenating activities. From Italy, this product is one of the best essential oils for psoriasis because it can also be used to treat other skin infections. We also love its citrusy scent—very fruity but not too overpowering. The company also promises to deliver only superior products. No bases have been added, which we think is a plus for quality and credibility. Bergamot oil helps in replacing dead skin cells by stimulating the growth of new, healthy cells. For a great psoriasis relief, apply the oil to the affected area and shine a long-wave UV light on the spot. It also has the potency of an insecticide to protect us against parasites, and its antiseptic properties help in reducing the growth of bacteria on the skin. This is one of the best oils for psoriasis for its anti-inflammatory and antifungal properties. Manuka trees from New Zealand are highly potent and have been used as a multi-purpose medical aid for centuries. Additionally, some Psoriasis sufferers have reported that the symptoms were reduced after continuous use of the product. soaps, shampoos, body washes, and creams to increase its healing properties. Native to New Zealand, Manuka Oil is extracted from the branches and leaves of the Manuka tree. Manuka Oil is known effective against psoriasis because of its antimicrobial properties. This is the reason the said oil is a popular choice for treating various skin conditions. Manuka Oil also has anti-inflammatory and analgesic properties, making it perfect for the discomfort caused by psoriasis. One essential piece of advice: if using Manuka Essential Oil, dilute it in water or almond oil first before using. Undiluted essential oils can be irritating to the skin because they are highly concentrated. This product is perhaps one of the most versatile ones in this group. Aside from psoriasis, it can also be used to treat stretch marks, toenail fungus, and sun damage. It is generally used as a skin conditioner, for a more glowing, vibrant, and youthful appearance. Another great thing is that it comes with an USDA organic certification. Products should keep up with strict standards including it shouldn’t contain any fillers and other ingredients. Most products fail to meet this requirement, which means that you’re only getting the best from this company. Because it contains calophyllic acid, this oil can eliminate flaky or scaly patches on the skin by regenerating new skin cells. It can also penetrate into the layers of the skin, making it an ideal way of locking in moisture. How Can I Use Essential Oils for Psoriasis? The most common method is by applying it topically. But because essential oils are potent and can cause skin irritation, it is recommended to mix it with a carrier oil before use. Though this process is completely optional, it should still be considered so as not to worsen any symptom brought by the condition. The best choices for a carrier oil include tamanu oil, jojoba oil, and coconut oil. To retain the scent of the essential oil, stay away from carrier oils that have a strong scent. Cold-pressed and organic essential oils are the best options for psoriasis treatment. Another option is by applying it in cream/lotion form. Aloe Vera is a popular choice, and once applied on the affected area, symptoms such as itching and redness were reduced. In one placebo-controlled trial, research suggests that when 0.025% of capsaicin cream is applied 4 times a day for 6 weeks, itching caused by psoriasis was also reduced. The cream however cannot be used on the face or on open skin, as it may cause a burning sensation. Are There Some Points to Remember When Using Essential Oils? Never take them internally. Some can be very toxic, and taking in even just a couple of drops can be dangerous. Always use a carrier oil to prevent further irritation, especially if you’re dealing with a highly concentrated oil. As for prolonging their shelf life, use cobalt or amber-colored glass jars in storing essential oils and store them in a dark, dry, and cool place. Essential oils can last a maximum of 3 years when stored properly. Ease of application: Determine whether or not they are practical for daily use. Properties: How effective is it in dealing with psoriasis? Versatility: Can it also be used to treat other skin conditions aside from psoriasis? Value for money: Am I getting my money’s worth with this, or should I go for the cheaper-yet-as-effective one? Living with psoriasis can be difficult. You have to deal with sudden flare-ups from time to time, and the amount of self-control it takes to resist the urge of scratching yourself. It’s like living with an itch you can’t scratch. 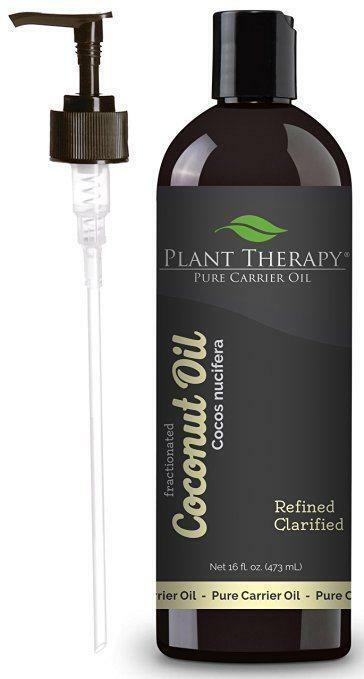 We have chosen Plant Therapy’s Fractionated Coconut Oil as the winner of this roundup. Yes, it is a carrier oil, but it has made it to the top for good reasons. First is its versatility. It can be applied directly on the skin, or it can be mixed with your favorite beauty products to enhance its effects. The fun part is that it is ridiculously cheap. Where can you find a product that’s highly-recommended and offers the most value for money at the same time? Now that we have chosen the best essential oil for psoriasis, all you have to do is give it a try. We’re confident it’ll work for you and that you’ll be glad you gave it a go.